Game - England versus Australia ! Click here for the original blog post. England managed to take the lead in the last few weeks after their atrocious start. Was that tactical play lulling Australia into a false sense of victory ? 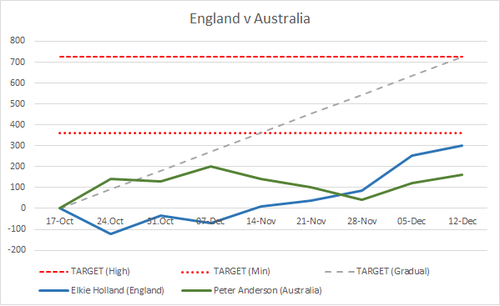 It is apparent that neither England nor Australia reached the minimum aspirational target level (bottom red line). Recruiters are naturally optimistic about their abilities. Recruiters dip up and down in output and success levels. Recruiters DO NOT give up but pick themselves up and carry on until the end. Recruiters admit their own failings and successes. (We didn't diddle the figures to publicly succeed!). Do not set competition parameters whilst under the influence of copious amounts of alcohol with inflated opinions of their superhuman abilities mixed with huge ego levels !! England and Australia are happy to laugh publicly about the affect alcohol can have on egos and the wisdom of alcohol and business !